Below is a story of the courage and faith of a young man in Post-Soviet Russia whose memory is honored by many Orthodox Christians in Russia on May 23rd and August 20th, though he has not been officially canonized as a Saint of the Church. Evgeny Aleksandrovich Rodionov was born thirty minutes after midnight on May 23, 1977 in the village of Satino-Russkoye near Moscow in what was then the Soviet Union. According to his mother, as a boy in this small village, all he really wanted was to be a cook. When he was eleven years old, Evgeny Rodionov received from his grandmother a little Cross on a chain. He wanted to wear it to school, but his mother, then an atheist, warned him against it, since the communist authorities frowned on such things. Evgeny wore it anyway and refused to ever take it off. In 1995 Evgeny turned eighteen and was drafted into the Russian armed forces as is required for all Russian men. Right before being drafted, Evgeny was baptized in the Russian Orthodox Church on his own accord seperate from his parents who were still atheists. For his duty he was chosen to work in a frontier guard unit (something of a mix between the US Border Patrol and the National Guard) and sent for training in the Kalingrad area of what was formerly East Prussia. After training he was sent to the border of Chechnya and posted near the town of Galashki. This was towards the end of the controversial First Chechnyan War. On the night of February 14, 1996, just six months after he started his service, Evgeny and three comrades were captured by a force of Muslim Chechen guerillas who were disguised in an ambulance while the Russian soldiers were manning a checkpoint. "They [Evgeny and the soldiers with him] patrolled the border between the republics of Chechnya and Ingushetia. Their control and registration post was located some 200 meters far from the security detachment. The post was just a small cabin, without any light or wire communication. The cabin did not even have a military support, in spite of the fact that it was a single cabin on the mountainous road, which was used for carrying weapons, ammunition, captives, drugs and so on. The border guards stopped an ambulance vehicle to check it. More than ten armed Chechens got out of the vehicle. Needless to mention that it was very easy for them to cope with young inexperienced soldiers. The guys showed as much resistance as they could, but the outcome of the fight was evident before it even started." Upon capture they were held in the cellar of an abandoned house for 100 days as ransom demands were sent to their families. Kidnapping and demanding ransom was almost a cottage industry in Chechnya during that time period. They kept Evgeny hanging by his wrists in a basement. They starved and beat him. Rodionov's ransom was reported to be 50 million rubles (1.6 million dollars) - at the time an impossible sum. Another report says it may have been in the $10,000 range. Whatever it was, the ransom was not met. 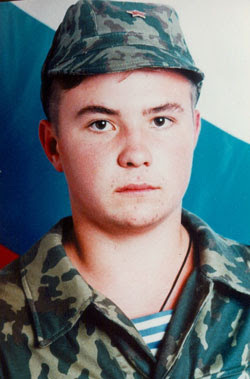 Chechen field commander Rusland Haihoroev (also spelled Khaikhoroyev in some sources) eventually beheaded Evgeny with a rusted saw that took over an hour to complete on May 23, 1996 (his 19th birthday) near the settlement of Bamut. His body, along with four other Russian prisoners were placed in a bomb crater outside the village of Alexeevskaya and covered up with lime and dirt. Haihoroev stated later in an interview that he only killed Rodionov after the soldier denied conversion to Islam and refused to give up his Orthodox Cross, while two others with him had converted to Islam. Russian troops occupied the village where Evgeny was murdered the following day after the execution. Lubov took Evgeny’s body away along with the bodies of his murdered friends. She returned to Moscow with the aide of the Russian Orthodox Church and buried him. When Lubov Rodionova came back home, Evgeny’s father died five days after the funeral. He could not stand the loss of his son. “We know that he had to go through horrible, long-lasting sufferings that could be compared to the ones of great martyrs in ancient times. They were beheaded, dismembered, but they remained devoted to Jesus Christ anyway,” priest Alexander Shargunov said during the requiem in Evgeny Rodionov’s memory. Evgeny was posthumously awarded the Order of Courage by the Army. Lubov Rodionova later returned to Chechnya on a second trip and recovered her sons head. Haihoroev himself and his bodyguards were killed on August 23, 1999 in a fight between his group and a rival Chechen band. The soldier's fate would have probably been forgotten, if a Central TV film crew had not come to the village where Evgeny's relics now lie six years later to shoot a short report on a Cross being set on a restored church. Parishioners told the reporters about the heroic deed of the son and the courage of the mother, who had buried him in his homeland. They filed the story as a separate report. A year later a huge devotion spread throughout Russia and the entire world. "As his story has spread, pilgrims have begun appearing in this small village just west of Moscow, where his mother, Lubov, 51, tends his grave on an icy hillside beside an old whitewashed church. Some military veterans have laid their medals by his graveside in a gesture of homage. People in distress have left handwritten notes asking for his intercession. In a church near St. Petersburg, his full-length image stands at the altar beside icons of the Virgin Mary, the Archangel Michael, Jesus and Nicholas II, the last of the czars, who was canonized three years ago. "Thy martyr, Evgeny, O Lord, in his sufferings has received an incorruptible crown from Thee, our God, for having Thy strength he has brought down his torturers, has defeated the powerless insolence of demons. Through his prayers save our souls." Icons and pictures of this young man Evgeny spread around Russia very quickly and he was hailed as a New Martyr for Christ. In these icons sometimes he wears a uniform, sometimes a red robe (which is a way he appears in visions to the faithful, especially soldiers and children), sometimes armed, sometimes holding a Cross of martyrdom, but always with his halo. 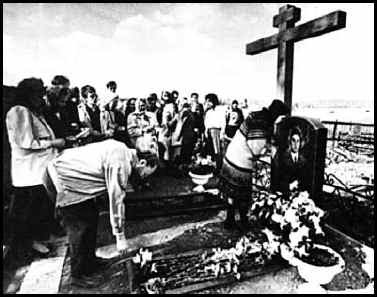 The picture distributed of him shows Evgeny wearing the Cross around his neck for which he died. Miracles have been occurring in connection with Evgeny's relics as well. During a religious procession in commemoration of Martyr Evgeny on November 20, 2002 the icon with the image of the soldier started secreting sweet-scented myrrh. His own Cross, the one that he refused to give up, his mother has donated to St. Nicholas Church in Ordinka, Moscow. Because of the huge devotion to the New Martyr Evgeny, the pious faithful sought official canonization from the Moscow Patriarchate. Initially they refused and this divided the Orthodox in Russia. Maksim Maksimov, secretary of the canonization commission, explained the Synod's position in Tserkovny Vestnik (Church Bulletin), the official publication of the Russian Orthodox Church. His arguments can be summarized in three points: the only evidence that the soldier was executed for this faith is the testimony of his mother, who in her love made a god of her son; the Russian Orthodox Church has never canonized anyone killed at war; the period of new martyrs ended with the collapse of the Bolshevik regime. However, he emphasized, the deceased can be honored without canonization. Patriarch Alexy of Moscow personally blessed the popular account of Evgeny's life, but worried that his cult would balloon into anti-Muslim rage. Opponents of the decision, including well-known priest Alexander Shargunov, argued that an outbreak of people's love is enough for the truth; that Evgeny's grave works miracles, curing the sick and reconciling enemies. They also point out that the solider did not die at war but in captivity, and that to say that the time of martyrs is over is near heresy. A Church in his name that honors his patron saint was built in Hankala, near Groziniy, in August 2002. It is the only Orthodox Church in Chechnya. 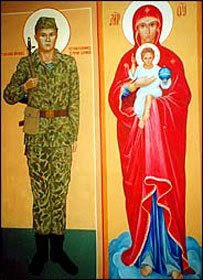 On October 21, 2008 soldier Evgeny Rodionov was numbered with the martyrs as a locally venerated saint of the Astrakhan Eparchy of the Russian Orthodox Church. Evgeny's mother, who never before set foot in a church, is now an Orthodox Christian believer, saved by the example of her son, the Holy Martyr Evgeny Rodionov. Eventually the faithful helped her to raise enough money to buy a new home. Evgeny Rodionov’s biography was published in a booklet that came out in 2002. 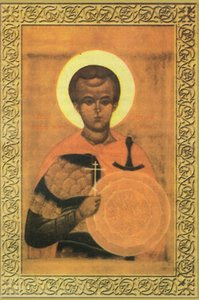 The book was called The New Martyr of Christ, Warrior Evgeny. The fifth edition of this booklet was the one blessed by Patriarch Alexy. It was written by priest Alexander Shargunov who is a noted communist and nationalist which in turn has been the cause of speculation regarding the truth of his tale. Some say Fr. Alexander merely contemporized a story from Dostoevsky's The Brothers Karamazov (Book III, Chapter 7, “Disputation”) to promote Russian interests in the Chechnyan War. Though this tale of Dostoevsky, which is based on actual events as described by Dostoevsky in his Diary of a Writer (1877), is very similar to the story of Evgeny, this only testifies to the possibility of its actuality. This argument does not hold up when the testimony of Evgeny's mother and executioner bear testimony to the truth of the tale, as well as the fact that there is video evidence to prove Evgeny was beheaded and countless stories of miracles reported by the pious faithful. Evgeny's relics also testify to the truth of the story. There are a few videos being ciculated on the internet of Russians being beheaded by Muslim Chechens. In fact, there are over 400+ hours of such videos known. They say that a video was made by the Chechens of Evegny's death as well, though its whereabouts are unknown. According to one person who has examined all these videos, as well as the execution of Evgeny: "They used the rusted old saw, and slowly sawed his head off. Everything was filmed, and when Lubov Rodionova came to see the field commander who did it, he gave her a tape with her son's execution on it." I must warn my readers that these videos are very gruesome and are best avoided, as they will likely leave your mind in a frenzy for a few seconds as they did to me. The Chechens preferred this atrocious method of execution because they followed a legend saying that a decapitated victim would not come for the murderer after death.